I was provided a copy of this book to review. All opinions are my own. 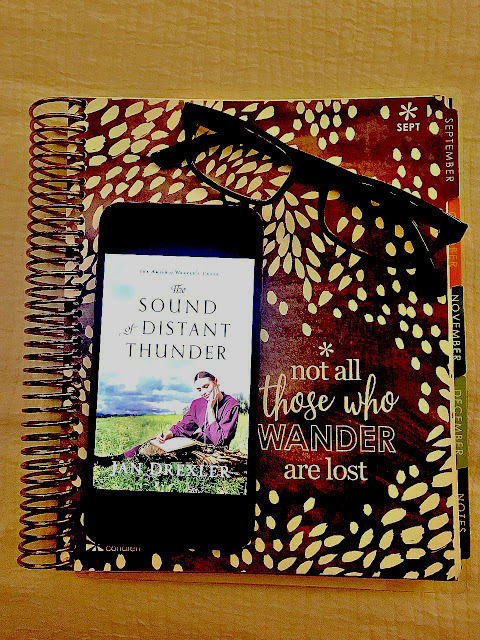 The Sound of Distant Thunder (The Amish of Weaver's Creek Book 1) is an engaging historical romance with the backdrop of the Civil War. The main characters, Jonas and Katie, are two young people who have fallen in love but haven't the permission of their parents to marry. Jonas is unbaptized and isn't allowed to marry. Katie is 17 and her father insists that she waits until she is 18 to marry. In the meanwhile, Jonas begins to build a house on a cleared lot near his family. In his Amish community, that is a sign that he has intentions to marry, so Jonas' family is happy that he intends to be baptized. However, Jonas hears about the battles of the Civil War, which he feels he should be serving. He is torn between being baptized and married, or serving in the war, helping to end slavery. When his married brother's number is called to enlist in the armed services, Jonas steps up to take his brother's place, leaving Katie worried and heartbroken. While Jonas is away, he and Katie write a series of letters to one another. For me, these letters are beautiful pieces of writing in the middle of the ugliness of war. It is this author's technique that I firmly believe makes this Amish based romance something unique. They are innocent, touching and romantic. The Sound of Distant Thunder (The Amish of Weaver's Creek Book 1) is an engaging historical romance with the backdrop of the Civil War. The main characters, Jonas and Katie, are two young people who have fallen in love but haven't the permission of their parents to marry. Jonas is unbaptized and isn't allowed to marry. Katie is 17 and her father insists that she waits until she is 18 to marry. While Jonas is away, he and Katie write a series of letters to one another. For me, these letters are beautiful pieces of writing in the middle of the ugliness of war. It is this author's technique that I feel strongly makes this Amish based romance something unique. They are innocent, touching and romantic. Author Jan Drexler has a beautiful command of the language, painting this beautiful scene in my imagination: "The scene outside the barn door was fresh and clean, as if God had given the world a fall cleaning." While there are some loose ends in the book (why do we even have to know of Ned Hamlin, anyway?) the story wraps up nicely and is open and ready for Book 2.